PC Win Booster Free is a free disk utility designed to help you keep your disk clean by removing any unnecessary folders and files. Usually, these unnecessary, or junk files appear as a result of program's incomplete uninstalls, Temporary Internet Files, Recycle Bin Files and Unused Empty Folder. 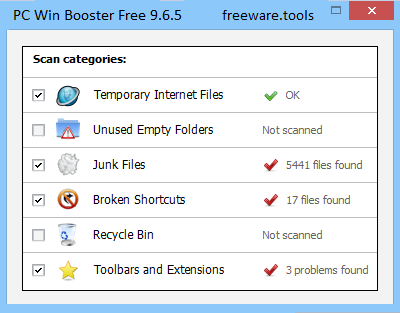 PC Win Booster Free, with its intuitive and easy to use interface, helps you quickly wipe out all the junk files. Using the program is indeed easy. It also works fast when both scanning for files and removing files. PC Win Booster Free also finds duplicate files like identical pictures, documents and any other files. It compares files not only by names, but by their content. The program quickly scans common computer areas and comes up with a full report of the errors identified during it. Moreover, you have the possibility to manually select the files to be deleted during the fix-up stage. There’s no harm in running the utilities twice, in order to be sure that nothing toxic resides on your system anymore. All in all, PC Win Booster Free comes across as an intuitive and easy to use computer optimizer, but lacks the means to backup the registry before proceeding to the cleanup operation, as most similar applications do. You will have to carry out this task yourself.